► What to give for Christmas this year? I’ve started my list. 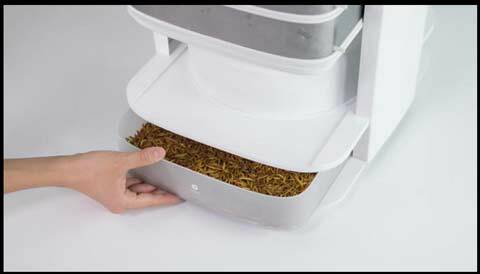 This Desktop Edible Insect Hive Grows Your Daily Protein At Home. Feed your livestock kitchen scraps, harvest and prepare–all on your kitchen countertop. Comes with a starter kit of mealworms. Think of it: the mealworm smoothies; quiches; stews and casseroles! High in protein, low in carbs. No animal diseases transmitted; no hormones or antibiotics required; no farm effluents to pollute local waters. We’ve had a lot of tiny ticks (8 – 10 at at time) off the dogs this month. If found inside, they go down the drain, but outside, each small dark dot is compressed against the pavers with a piece of gravel. And with this action, each minuscule arachnid produces a most distinctive “TICK!” and that, I claim, is how the tick got its name. ► Lastly, as an alternative for those who for some odd reason have not already gone to Livin Farms to order your Insect Hive for that special someone on your Christmas gift list, it’s that time of year again when I mention that you can replace your loaned-and-not-returned copy of Slow Road Home or What We Hold in Our Hands OR buy a few as gifts. You know you’ve thought about doing just this very thing and now is the time to put legs on the notion. Go to Fragments from Floyds/stuff to order, or find them in Floyd at the Country Store, Artisans Studio in the Station, at Hotel Floyd or the Jacksonville Center for the Arts. But order direct from me for a better deal and with the potential of a special inscription upon your request. Let us know how the mealworms recipes turn out! I’ve started my Christmas list as well, and am pretty sure at least six of those fortunate people would LOVE the mealworm starter kit. Must run right out and order me some!